Hörspiegel: Hi Martin. Your new album "Esoteric" was released a month ago. It's your fourth album and it took you five years to come up with it after the last album "Spectral". What has happened since "Spectral"? Martin Hanner: Some time after the release of Spectral our label at the time Arise Records went bankrupt, so we had to start working on new material that we could send out to labels. But we also decided that this time we really wanted a serious label that plans ahead, look after the artists and not just sign a lot of bands they cannot afford to make promotion for later on. Also, during this time both our bass player and vocalist decided to quit the band. So that was another thing we had to deal with; to find replacements for those guys. I think we were lucky to find Johan Reinholdz and Joakim Karlsson. They are really nice guys and awesome musicians. Fortunately, we also found an amazing label in Pivotal Rockordings and here we are today. Even though it has been a long time since we released anything I really do think these changes have strengthened the band. Hörspiegel: What has changed with the new bandmembers? Martin Hanner: In terms of songwriting things haven’t changed at all since it’s still Andreas and I that write the songs. For Esoteric though, we did add sections for Johan to do solos in, but that’s pretty much it. But in the future it’s possible that the other guys will get more involved in the songwriting process. Lyrics wise, there are some changes that have been made since our former members Jonas and Henrik wrote most of them. Now Joakim, our vocalist writes most of the stuff. Our lyrics are still leaning towards the darker side just like they always have been, but they might deal with some slightly different subjects than before. 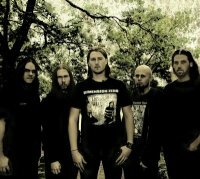 Hörspiegel: "Esoteric" was mixed & mastered by Scar Symmetry member Jonas Kjellgren. Are you fans of his band or productions, or what else was the reason to choose him for the job? Martin Hanner: I like his band Scar Symmetry, especially Holographic Universe, and we all knew, even before we hired him to take care of the mixing and mastering, that he is really good at what he does. It was Pivotal Rockordings idea to use him since they had worked with him before and that was a good call, because I think he did an amazing job with Esoteric. Hörspiegel: There are lots of orchestral sounds and elements on "Esoteric". Martin and Andreas, you are the men behind the keyboards. Which orchestra library do you use, and how do you handle the keyboards while playing live? Martin Hanner: We use symphonic orchestra. When we play live, we backtrack the orchestra and the choirs. That is what we think gives the audience the best experience, especially now when we have so many harmonies and different instruments playing at the same time. It would be impossible for a keyboard player to pull that off live, so that’s we have decided to handle it this way. Hörspiegel: Do you enjoy playing live, or do you prefer doing the studio work? Martin Hanner: You know, I love both parts. The song writing and recording process are fun but at same it can be really frustrating because it takes so much energy away from you. But when you have finished writing a song that you are really satisfied with it feels so good. When it comes to playing live it’s all about giving 100 % and deliver a good show to the fans. It might be tiresome in the long run, but not in the same way as when you are recording, because live you get so much back from the audience and when it all comes down to it, that’s one of the things that keep you going. Hörspiegel: What was the reason for you to start a band, and which bands would you name as your influences? Martin Hanner: We started Skyfire because we love metal music, love to write songs and last but not least, we have a good time while doing it. I really like the atmospheric and progressive elements that bands like Symphony X and Bal-Sagoth use. Esoteric is a mix of many different styles though. We have the traditional Skyfire parts with melodies and bombastic orchestra parts, but we also have more progressive sections as well as some darker sounding ones. When it comes to the more orchestral parts in our music I get a lot inspiration from music in films. For example, the soundtrack for ‘The Rock’ is really cool in my opinion. Other times I think bands like old Atheist inspires me along with bands like The Crown and Embraced, but most of the time I get inspiration from just sitting down and jamming on my guitar or keyboard. Hörspiegel: The last words belong to you. 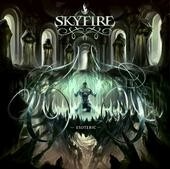 Martin Hanner: Thanks for the interview and your interest in Skyfire!